When I was a 14 year-old-girl a tumor the size of a softball was removed from my ovary. I kept that damaged ovary for another 14 years because doctors were afraid to remove something of importance from someone so young. When I had an emergency hysterectomy at 24 and cancer cells in my cervix I still kept that damaged useless ovary. Until I was 28, when it became obvious my health, and therefore my life, was at risk. Then it was finally removed. I consider myself lucky. Staying one step ahead of full blown cancer at all times. I can no longer have children, but I’m alive and healthy. There are many women who find out about cancer so late in the game that the battle can be overwhelming and devastating. Thanks to Foodbuzz and Electrolux I will attend the Ovarian Cancer Research Fund event in New York City. I am in awe that I get to go, and feeling quite overwhelmed. I’m not sure I deserve this, but am grateful for the opportunity. As I comb through OCRF I can’t help but find myself drawn to the survivor stories, and finally to the tribute page. These pages are filled with vibrant women with beautiful smiles. All of them fought this dangerous cancer. Some won, others lost, and all strove to survive. Their stories are amazing, and worth reading. I hope you’ll take some time to do so. It’s important, this cause, because ovarian cancer is typically found much to late as there isn't a good tool currently for early detection. If found sooner, there would be a better chance of survival, and hopefully an opportunity for these women to have children of their own. So today’s recipe is dedicated to living joyfully and to flavorful healthy food to feed our bodies and spirits. I hope that one day cancer will be detected much earlier, and be better treated. Through foundations like OCRF there is hope that our own daughters and granddaughters won’t need to worry about fighting for their lives, when they should be living them instead. 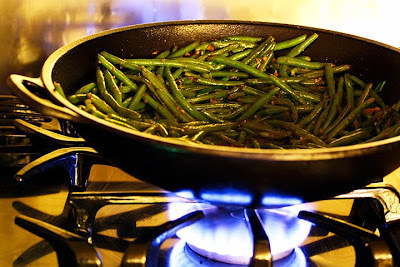 I serve these tender garlicky green beans over perfectly cooked brown rice for a fresh, flavorful, healthy meal. 1. If using fresh beans wash the beans, drain thoroughly, and trim the tops and bottoms. 2. Heat 2 Tablespoons oil over medium heat. Add the beans and stir-fry until they start to shrivel and turn brown, 5 to 10 minutes. Remove the beans and drain in a colander or on paper towels. 3. Heat 1 Tablespoon oil in the wok on high heat. Add the garlic, ginger and scallions. Stir-fry for a few seconds, then add the chili paste and stir-fry for a few more seconds until aromatic. Add the beans and the remaining ingredients. Mix together and serve. Serves 2 to 3 as a main dish. Recipe adapted from Rhonda Parkinson from About.com. Picture by Laura Flowers. Thank you for sharing your story. Thank God you stayed ahead of the cancer! And thank you for the delicious recipe idea. I can use this recipe (subbing the peanut and soy sauce) as an allergy free meal idea for my family! I hadn't thought of fresh green beans and brown rice. I'm going to definitely try this! I had no idea about the ovarian cancer. I am waiting results that should come this afternoon from a retaken xray to see if the cancer I had (uterine) has spread to my lungs. I'm not dead yet so I'm not whining. I know a lot of ovarian cancer survivors online. For some reason they have come to my blog (write more about uterine and day to day life than cancer) Am friends with many of them on FB too. This is a beautiful, informative post. I'm glad you found your issues before cancer found you. And green beans are one of my favorites. A cancer cure fer shure! The dish sounds good, and I want to know more about what you will be doing? I want details of this trip! Chef, I am so sorry about your daughter. That is a journey no one should have to take. Ever. That is a cast iron wok! I love that darn thing. I got it at Ross for $15 bucks. I felt like I'd won the lotto! And we'll be learning how to decorate cake there I believe. I have some basic skills, but no more than that. I hope I am teachable! POD I am thinking about you today. Big happy positive thoughts! Thank-you for sharing. This post makes me feel so vulnerable, but you make me feel that it is ok somehow. I am a friend of POD, and I had ovarian cancer 2 years ago. Now I am waiting for a biopsy on 'something' that appeared on my last scan. In the meantime, I am eating lots of nice things, drinking good wine and enjoying myself tremendously. Have a wonderful time at the event - what fun! I will look forward to seeing the post about it. I shall definitely be trying the bean recipe. Thanks! Thank you so much for sharing your story. It means a lot!! You do deserve to go to the Ovarian Cancer Research Fund!! Thank you for sharing your story. You are an inspiration. Enjoy your time in NYC. btw the green beans look yummy. Oh Laura, Thanks for sharing your touching story. I am so happy that you are a survivor!!! My mother and older sister both died of ovarian cancer in their 50's. I am so happy that you are able to participate in such a great cause! I would be thrilled to see an early detection method devised, especially for my daughters and granddaughters!!! What an amazing story! You deserve to go of all people! Fingers crossed you stay healthy and happy. As a side note - I am stealing your green bean recipe! I love all things spicy. Wow Laura, thank you so much for sharing your story with us. I can wait to meet you here.Stay healthy! The more I learn about you Laura, the more I'm amazed at your courage and strength and indefatigable sense of humour. Hugs to you on your journey, thank you for sharing. What an inspirational story!! You are a very courageous woman and I'm so glad you get to go. What an inspiring story..You are so brave !I too sincerely wish , soon they will find a cure to cancer ! L - Thanks for your message and kind offer, I'll meet with you for lunch, dinner, breakfast, etc. Please no treating...:) I'll just be returning from Provence on the 7th. Pls. e-mail me at christineinnewyork(at)gmail.com, so we can coordinate. Thank you so much for sharing your journey, your strength - and your recipe. I've learned from you today. Thank you for sharing your heart touching story! I wish you all the best on your trip and look forward to hearing all about it. Your string beans sound delicious! Spicy and loaded with tons of flavor. Thank you for sharing your story. So thrilled for you! Just found your blog. It is just beautiful and creative! Thanks for sharing your story. You deserve this trip and can't wait to hear about it. Oh wow - sounds like a perfect event for you to be invited to! Thanks for sharing - I'm so happy you're here to share!!! PS - I LOVE garlicy green beans!! I'm in shock. A very good friend food blogger just told me about the loss of her sister to ovarian cancer when her sister was 21 - you and those who love you are very lucky! We should all appreciate every single day on this earth - that sounds clichéd but it is so true. And bringing up these issues - telling your story - is so important to making everyone aware of the need for medical research and finding cures for this and other terrible diseases. I am glad you have the opportunity to attend this event. Hugs to you! Thank you for sharing your story. Feb.4th will make two years that (colon) cancer took the life of one of my BFF. You do deserve to go! I am so glad that I found this post despite clearing my reader after my hiatus. Like others above, I thank you for sharing your story with us, for calling attention to this disease in such a positive light.